Unless a large part of the film ends up being live action 4K seems like a financially counter-productive expense for a project that is not captured in a real world environment with real actors. For one of THE big anime films of this year (? )/the comong years, I don't know if just staying behind with 1080p is the way to go. Not something I particularly mind, but they might go with 4k just for the advancement. You can tell it's 1080p if you approach the screen enough (I've done that). Gendo'sPapa wrote: Nothing in The Lord of the Rings trilogy was shot on 70mm. That was a 35mm production through & through. Don’t know where you got that it was shot on 70mm. Anyway, the short answer is likely - No. It’s not being “shot” in 4K. Unless a large part of the film ends up being live action 4K seems like a financially counter-productive expense for a project that is not captured in a real world environment with real actors. Though since there’s money to be made I’m sure an upscaled “4K” release will be available when the film hits home video. Holy crap, you're right. I'm gonna have to re-read a few film books I read in college, then. It seems as though all the information has started to melt together in my head. Any who, I don't know if I would even bother with a 4K upscale. I don't even have a 4K system yet, and on the day I do, I would probably still wanna keep a 1080p system for all of the wonderful 2K/Full HD productions that were made. Heck, I still have a CRT TV in order to watch SD interlace-produced television productions without any de-interlaced filters interfering with the picture. The point is that I prefer to watch movies and TV shows in as close to the original production quality as possible, so upscales of any kind aren't my cup of tea. And honestly, there isn't a whole lot convincing me to get a 4K system, since I would only want it for the HDR capabilities, and would obviously want to see those colors on an absurdly expensive OLED screen. I mean, I sit 9 feet away from the screen. You cannot notice any higher pixel resolution from that distance. The 4K would simply prevent any downscaling potentially negatively effecting the image. And seeing as how I don't want to pay $3,000+ for that kinda screen, I am more than content with my 1080p LED system. I don't really see a reason for Final to be shot in 4K. From a thematic perspective, sure, higher resolution will show a crisper image, then would it be 30fps or 60fps? There is only so much detail the eye can pick up, and from a cost perspective (I am an accountant after all) it may be far more costly and time consuming to recreate or properly correct all the animation files to be rendered in 4K ans simply stick with 2K, which, if we're being honest, isn't a horrible resolution. ^ If shot in 4K, it would probably still run at 23.97 FPS. If it's going to be in 4K, we'll know about it when it's time. I'm retitling the thread to better reflect its actual use. Let's keep it on topic please. DarkBluePhoenix wrote: I don't really see a reason for Final to be shot in 4K. From a thematic perspective, sure, higher resolution will show a crisper image, then would it be 30fps or 60fps? There is only so much detail the eye can pick up, and from a cost perspective (I am an accountant after all) it may be far more costly and time consuming to recreate or properly correct all the animation files to be rendered in 4K ans simply stick with 2K, which, if we're being honest, isn't a horrible resolution. At the risk of Reichu's wrath, I never got the point of 4K. It's like IMAX for the home, but IMAX is only really impressive on a titanic screen. Comparing 4K and 1080p televisions in Best Buy, I've had to actively walk up to the screen, maybe a foot away from each, to really notice a difference. Seeing as how FINAL likely started production before Shin Godzilla, I doubt it will be 4K, which I'm overwhelmingly OK with. I just hope Funi doesn't spend half a decade bringing it over. AdamMalkovitch wrote: Seeing as how FINAL likely started production before Shin Godzilla, I doubt it will be 4K, which I'm overwhelmingly OK with. I just hope Funi doesn't spend half a decade bringing it over. Did "keep it on topic" need to be both bold and red? *smacks A.M. upside the head* If you have the initiative to anticipate out loud that you're crossing something a mod said, you have the initiative to waddle over to Off Topic and gripe about 4K there. 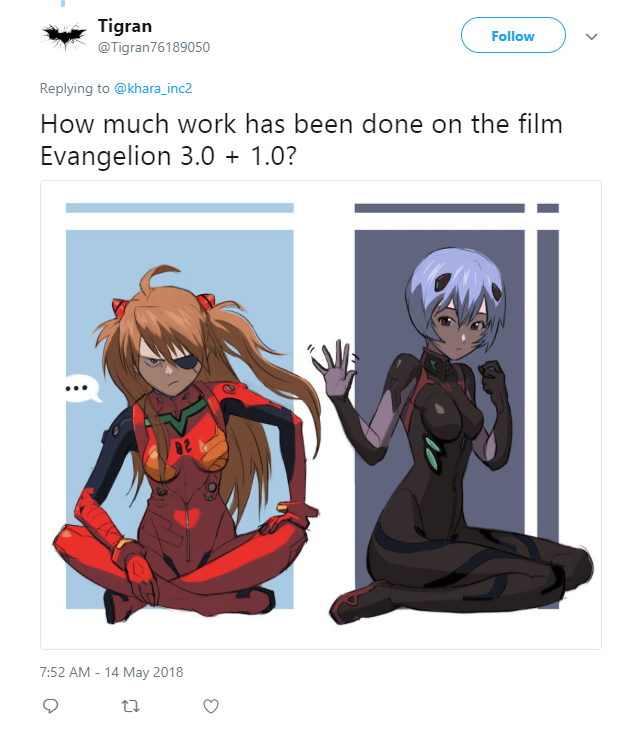 Anno wrote something about the last week of work for the Eva shinkansen, I don't think there's something movie related in there but I can't translate the picture so I don't really know. Joseki: More information about that tweet in the appropriate thread. Another Monday, another photo at a camera recording strange stuff. Was gonna speculate about stop-motion, but seems too cumbersome to reach the point the camera is pointing too. Edit: Oh, that is what it was for. Fascinating to see these little bits. They were doing Shin Godzilla 2 all along. Such a relaxing sound btw. I love these kind of improvised effects in film making, never knew they did it for animation too. kuribo-04 wrote: They were doing Shin Godzilla 2 all along. They're actually shooting the Japanese version of Mythbusters! Lookin forward to lots of beautiful effects animation. This is the result photo.